Over the past 10 years Karma to Burn and Sons of Alpha Centauri have engaged on an audio assault by ram raiding riff after riff into the instrumental stoner stratosphere. This cosmic mission commenced on star date 2007 when members of each band worked together on a project entitled 'Alpha Cat' resulting in the split collaboration album 'Last Day of Summer' released on Underdogma Records in 2009. 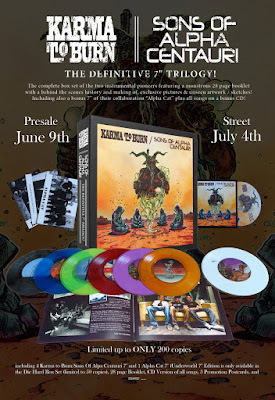 Karma to Burn will be back touring Europe this month and over the upcoming European tour they will publish, together with their friends of Sons of Alpha Centauri this strictly limited boxset as 'The Definitive 7" Trilogy!' It will be released (trippin') on the 4th of July! This will be available for a very short period with 45 boxsets available from Karma to Burn on their European tour and 25 boxsets available from SOAC via our Bandcamp page.